So far Kay Lindsay has created 48 blog entries. Developing a love of reading is something we work towards in the Grade 1/2 classroom. Although not every child is going to love reading, my hope is that every child develops at least an appreciation of reading. Fortunately, this year’s class is filled with children who love books of all kinds and who love to read. From the nonfiction books about volcanoes, which prompted many thoughtful questions in social studies, to the always popular children’s books like Miss Nelson is Missing, to our end-of-day read-aloud, The World of Pooh… The words we read spark images, the images spark imaginations, and new worlds open up our hearts. All day, every day, we are surrounded by books, including books that we have written. * Read aloud to your children as often as possible. * Keep books of all kinds in your home. Children who grow up surrounded by books tend to become lifelong readers. It is said that a home without books is like a house without windows. * Model reading whenever you can, by sharing what you read with your children: online news, recipes, a local newspaper, or even a piece of mail. A few days ago, two students walked across the room with their noses in their books. We were transitioning from reading time to music class, yet they just couldn’t stop reading. It was one of those moments that teachers of young children hope for, and it is one that all of us can help to create. On our first day together in Grade 1 and 2 we read Each Kindness by Jacqueline Woodson. Throughout the story we talked about ways to show kindness and why treating each other with kindness is important. In the story, the teacher has each student drop a small stone into a bowl of water. As they drop the stone each child shares an act of kindness that they performed. She tells them each little thing we do goes out, like a ripple, into the world. It is one of our classroom goals this year to spread kindness throughout our classroom and the BCD campus. This week we will go on a hike to find “kindness” stones which we will gently drop in water so that we can see the ripples spread wider and wider. Throughout the year, we will be putting paper stones (that we painted and cut) on our Kindness Wall each time one of us is the recipient of an act of kindness. I hope your child enjoyed our first week of school as much as I did. Thank you so much for sharing your child with all of us here at BCD! The answer is this. We read a lot in the 1-2 classroom. We talk a lot about what we read. We close our eyes and try to picture in detail the passages we most enjoy. We wonder. We question. We reflect. We predict. We imagine. In doing these things, we come to admire and care about the work of authors and illustrators. When a love of reading, writing, and storytelling permeates a classroom, children naturally long to become storytellers themselves. They look forward to the chance to weave their own tales through pictures and words. They jump into the process (some more boldly than others!) by first creating a map of the story they want to tell. Then, after writing a first draft, they share the draft with their classmates, answering questions and soliciting suggestions to fill in gaps and add details that will enrich their second drafts. Some young authors are so inspired that they even write a third draft before producing their final work. Just as we care about the authors and illustrators whose books we read, we care about our work as authors and illustrators. We hope you’ll care enough to stop by the classroom sometime, browse our Authors’ Shelf – currently boasting more than 18 books! – curl up on the couch, and lose yourself in a tale of imagination woven by one of our very own authors. They’ll love it, and so will you. If someone were to ask you “What is your favorite thing about BCD?”, what would you say? We had quite a day yesterday filling our hours with all things “trees”! In the morning we went for a trail hike. Looking up, down, and all around we came upon a variety of things from uprooted trees and a yellow caterpillar to a lone mushroom, lots of lichen, moss and flowers of varying colors. This morning we read Sue Williams’ story I Went Walking, converted the title to We Went Hiking and created our own version of the book based on what we saw during yesterday’s hike. We also worked on two art projects that focused on trees but in very different ways. First we took a look at the painting Tree of Life by Austrian symbolist painter Gustav Klimt. The children then painted their paper gold, let it dry, and then with brown paint created the tree trunk and swirling branches to mimic that of Klimt. Later in the afternoon, they worked with oil pastels to add design elements to the branches as Klimt had done. The results are hanging in our room – please come take a look! 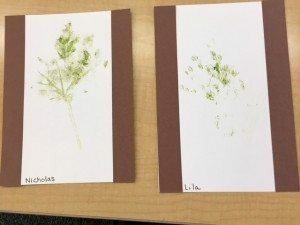 Our second art project was making leaf prints in a most unusual way. This involved the children pulling a fresh leaf from their BCD trees. 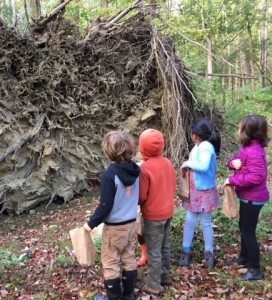 In general, we ask the children not to pull leaves off of their trees, but in this instance we needed fresh, healthy leaves that would have lots of chlorophyll within their veins. Once back inside, they each placed a leaf on some cardstock, covered it with papertowel and then gently hammered the leaf to release the chlorophyll. All of that hammering resulted in some beautiful prints. We ended our day working with Mrs. Allentuck’s fourth grade class to make tissue paper flowers to be presented to all of the grandparents and special friends who are visiting on Friday. We made close to 100 flowers! Enjoy the long weekend with your children. This week the first and second graders were assigned a BCD tree to study throughout the year. Our young Arborists are working in pairs (with nine in the class, one child is working independently) placing each first grader with a second grader. This week their first task was to find their specific tree by using picture clues, then record in writing and drawing three details of their tree, make a bark rubbing and measure the circumference of the trunk using string. During math class we compared the lengths of string, learned about rulers and yard sticks and set about finding the circumference in inches. We will be observing these trees from September through June noting the changes, characteristics, and recording information in individual tree books. In conjunction, the class is also embarking on our community service project for the year. Along with our tree study we are going to create a document for the BCD community that will identify and map the trees on campus. Next time you are on campus, ask your child to show you his/her BCD tree! The school year for first and second grade is off to a great start! On Wednesday we read one of my favorite books, Miss Rumphius by Barbara Cooney. In this story, when Miss Rumphius is a young child her grandfather tells her there are three things she must do in her life, the third being that she must do something to make the world a more beautiful place. Thank you for sharing your children with us. They are delightful!